As you enter the notorious concentration camp at Auschwitz, you cannot help but be sickened by the legend wrought in the ironwork of the main gates. 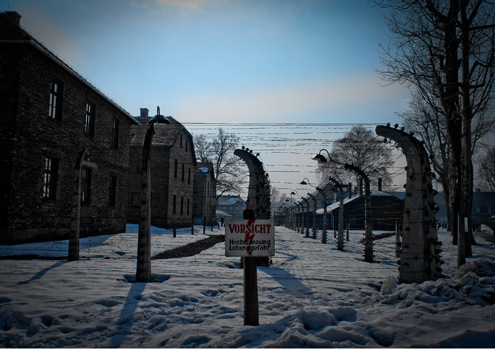 “Arbeit macht frei” – which translates as “Work makes you free” could not have been further from the real truth, unless the ruthless engineers of the Third Reich meant it in a twisted, ironic sense. It seems an odd thing to do in some ways, signing on for the ‘Auschwitz Birkenau’ tour, yet these organised trips out of Cracow will leave you feeling humbled and – unless you are particularly thick skinned – deeply moved. This is no ordinary tourist trip, but a journey straight to the heart of one of the most evil places on earth, so expect a stark reminder of just how cruel man’s inhumanity to man can really be. My dad is the one responsible for sparking an interest in both the first and second world wars. My mum always said she couldn’t understand his morbid fascination with the subjects; I guess some of it was down – as with a whole lot of other people – to nostalgia for a time gone by (isn’t it surprising how so many people of that generation remember the war years fondly? ), linked with a genuine interest in recent European history. He told me he had always wanted to visit the site of a concentration camp, and Auschwitz seemed the obvious one. I offered to take him, but his inherent fear of flying (or indeed anything which was a little out of his comfort zone these days) nudged him to decline. But the seed was planted, and even though I hesitated to admit it, I had in me a desire to make such a visit myself. I believe it’s one of those things that generates a certain amount of guilt. There’s a morbid curiousity which resides in most of us at some time or another, but to actually go ahead and act upon this instinct can sometimes make one feel a little uncomfortable. When I booked my trip to Cracow, I’d like to say that there was no real plan to visit Auschwitz, but I think I would be lying. Under oath, I would have to confess that there was no way I was going to be so close and not satisfy that need deep within me to experience my own reaction to something so dark. I’m sure we’ve all seen at least one holocaust film, probably for most Steven Spielberg’s amazingly insightful 1993 film Schindler’s List, after which many proclaimed “We must never let anything like this happen again!” – but believe me: seeing things for real leaves a tangible bitterness in the mouth, not just a nasty taste. There had been a snowfall in the days prior to our visit, but during the morning the sun shone brightly. It was a strange mix of emotions as we meandered in and out of the row upon row of wooden buildings,which had housed anything from desperate prisoners whose only hope was to perish quickly, to barbaric experiments carried out by fiends who had no regard for human life or dignity save their own. The camp was established in mid-1940, more than a year before the Germans embarked upon the “Endlösung der Judenfrage” (Final Solution of the Jewish Question) – the plan, systematically carried out, to murder all the Jews living in the countries occupied by the Third Reich. The direct reason for the establishment of the camp was the fact that mass arrests of Poles were increasing beyond the capacity of existing ‘local’ prisons. Initially, Auschwitz was to be one more concentration camp of the type that the Nazis had been setting up since the early 1930s. It functioned in this role throughout its existence, even when, beginning in 1942, it also became the largest of the death camps. The second part was the Birkenau camp (which held over 90,000 prisoners in 1944), also known as ‘Auschwitz II’. This was the largest part of the Auschwitz complex. The Nazis began building it in 1941 on the site of the village of Brzezinka, three kilometres from Oświęcim. The Polish civilian population was evicted and their houses confiscated and demolished. The greater part of the apparatus of mass extermination was built in Birkenau and the majority of the victims were murdered here. Our visit here – just three short kilometres from Auschwitz I – somehow drove home the feelings of desolation and desperation. There is a foreboding surrounding Birkenau that is all consuming; from the moment you arrive at the rail line which passes through the main gate (actually used in the filming of Schindler’s List) you can’t help but feel a connection with the poor souls who perished here. What actually went on we will never know, but there is enough evidence of atrocity still abundant here to denounce even the staunchest holocaust denier. As we passed through these hellish gates, the sky became a uniform, empty grey, and flakes of snow began to descend and gather under foot; it was as if nature were mirroring the desolation out of respect. Many of the rows of wooden huts have been demolished, but a sufficient number remain to paint the grim picture of what this place was like at the height of its genocide. As I stood still, not daring to smile or even pose for any pictures, I noticed something incredible. It was true what people had told me: no birds sang over Auschwitz Birkenau. On our journey back to Cracow, I wanted to cry. My head ached for the want of a good sob, but I knew that if I started it would be difficult to stop. I’m not even sure what or who I would be crying for. I mean, there’s the obvious answer of course, but this day had affected much more deeply than that. On some fundamental level I knew my life would never be quite the same again. It felt as if a dark spectre had sullied my soul. I was not alone in my sombre silence; no one in the bus spoke a word – not even companion to companion. Not even any gallows humour could deliver a little relief. It was only over a beer in the hotel bar later that night that I felt able to talk about the day. Don’t get me wrong, I’m so glad I made the effort and experienced the trip – I think more should – but I knew it was also a place I would probably never visit again. Its legacy though, would be indelible. i have visited here the atmosphere was different like something dark was hanging upon it. but it really was a really great experience seeing it in real life than in the films.most of it like the wooden huts had been demolished but i could still picture this gloom looking place in real life what it could have been like.for the fright these poor people had felt only the sign of desperation and really could not help the the people that perished but had to give there lives up here too. Holocaust is depressing but for me it would be hard to go to the camps were people were unjustly killed and punished. and i really hope it NEVERRRRR hapens agin!!!!!!!!!!!!!!!!!!!!!!!!!!!!!!!! I am very interested in the Death camps thats the nazis built and have always said that i would visit but upon reading books and hearing peoples stories about it I really dont think I could,it for me would be too overwhelming i dont think i could handle seeing it in real life,maybey some day I will we shall see.It must have been absolutely terrifying for those poor people.the world cant forget ever at what went on here. I like the way you narrate your visit- pretty sassy, i might add. This topic is so fascinating to me. It gives me so much anger but i can´t stop reading everything i can about it. I don’t know if it’s weird, but i’d love to visit Auschwitz, don’t judge me.